Originally published under the title "Turkey's Indigenous Weapons Industry: A Rover with Rolls-Royce Ambitions." Turkey's leading defense companies showcased dozens of weapons systems at the 13th International Defence Industry Fair in Istanbul, May 9-12, 2017. A former US ambassador to Ankara once described Turkey's regional (i.e., neo-Ottoman) foreign policy aspirations by saying that the country had "Rolls-Royce ambitions but Rover resources." The same could be true for Turkey's ambitious indigenous weapons programs. Turkey suffers from a "sizing" malady. When, in the late 1950s, Kemal Nejat Kavur was serving as the Turkish ambassador to Moscow, Andrei Gromyko, the then Soviet Commissar for Foreign Affairs, asked him: "Your Excellency, your country has the highest number of men under arms in Europe. If you turned them against your traditional enemies, the Greeks, you would be too much for them. But if you turned them against us, it would be too small. What's the reason for this?" During most of the twentieth century, Turkey's "sizing" problem revealed the secular state's misperceptions about security threats. Today, the problem reflects a combination of the Islamist state's illusions of grandeur, its leaders' "conquest fetish," a humiliating sorrow over having lost an empire (and the seat of the Caliph) within the collective memory of the Turks, and feelings of inferiority vis-à-vis the world's major "infidel" powers. President Erdoğan believes Turkey cannot trust weapons suppliers in the West. President Recep Tayyip Erdoğan's view is straightforward: Turkey cannot become a major regional power without military deterrence, but at the same time, it cannot trust conventional weapons suppliers from the politically western hemisphere. Therefore, for the sake of better deterrence, Turkey should rely on its own capabilities in developing arms. There is logic to this view, but it is not the whole story. 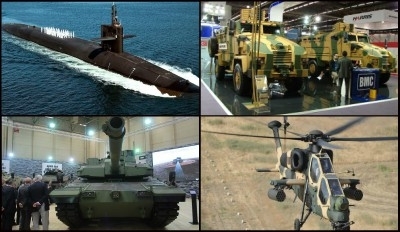 On May 9-12 in Istanbul, Turkey's top defense companies showcased dozens of new or enhanced systems at the country's biggest defense show, IDEF 2017. Among the systems showcased at the Turkish stands were surface-to-surface and air-to-air missiles, dozens of armored vehicles of rich variety, a new-generation tank, corvettes, a future frigate, short- and medium-range air defense architectures, several drones, helicopters, a basic trainer aircraft and its armed version, smart ammunition, and plenty of electronic, avionics, and warfare systems and simulators. What only a decade ago was primarily an exhibition at which the Turks were buyers had transformed into a show run by the Turks. Turkish officials proudly say local systems today account for 60% of the Turkish military's requirements compared to only 25% a decade ago – and they are targeting 80% self-sufficiency in the next few years. There is much to cheer about that, but there are also serious problems surrounding Turkey's self-aggrandizing behavior in building national systems. Most Turkish-built weapons systems rely substantially on foreign technology and components. According to the official narrative, Turkish firms are now designing and developing "100%" Turkish systems. In addition to the items listed above, their wares are said to include top-grade naval platforms (including submarines and their sub-systems), satellites and their launchers, and a fifth-generation supersonic fighter jet. The "100% Turkish" part of that narrative is only a populist joke. Only 50-60% of the naval platforms, mainly the platforms themselves and not their critical systems, are locally built. Turkey's first "100% Turkish" Landing Platform Dock, a much more modest aircraft carrier, is being built using Spanish naval technology. The "100% Turkish" new-generation tank boasts foreign armor and engine (even the "more Turkish" armored vehicles feature imported engines). The Turkish trainer is based on a Korean aircraft. For a reliable long-range air defense system, Ankara is negotiating to buy Russian-made S-400 systems. The Anka, the first "100% Turkish" drone and the pride of the Turkish industry, features a foreign engine, foreign landing gear, foreign landing and take-off systems, and a foreign surveillance pod – even a foreign name ("Anka" means "phoenix" in Persian). Turkey has signed two agreements with British Aerospace Systems to design and develop the "100% Turkish" fighter jet, which, too, will be powered by a foreign engine. 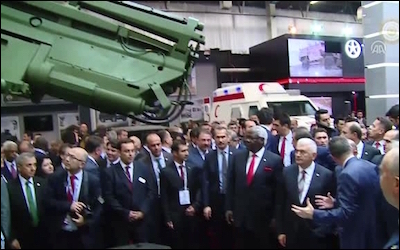 The Turkish defense industry isn't advancing at the dizzying pace claimed by the government. None of this means the Turkish defense industry is crawling. It is striving to advance and achieving some success, although not at the dizzying pace claimed by the government. Exports of defense and aerospace equipment and systems rose sharply to nearly $1.7 billion last year. But most export contracts come from friendly Muslim countries like the Gulf nations, Pakistan, Indonesia, and Malaysia. Turkey, the world's seventeenth largest economy, is home to only two of the world's largest 100 defense companies. IDEF 2017 was a Turkish show, and a promising one. But the potential problems are too significant to ignore. In addition to the sizing and Rover/Rolls-Royce challenges, Turkish engineering may fail to design, develop, and produce what it intends to in terms of desired capabilities, timing, and cost. At the Istanbul show, one Turkish company executive complained about another Turkish company: "They were trying to sell me [...] systems almost at the price of my whole platform. I found a better but non-Turkish system at less than half the price." Without a political push in the few remaining politically friendly countries, Turkish defense companies may find it difficult to compete with more efficient rivals. This could be bad news for those companies from a longer term perspective, no matter how much Ankara continues to push them. They may slide into corporate/technological laziness and fail to produce the desired technology at the desired time and cost. And that cycle might expose Turkey to the risk of operational weakness if national programs designed to equip the Turkish army turn out to be failures.